People who don't have a stable place to live need cash and other goods to survive. Cash may be used to pay for a sit-down meal, allowing them to stay out of the rain all afternoon. They may use cash to keep a cell phone connected, pool their money with friends for a hotel for the night, or buy a monthly gym membership to shower, rest, and stay fit. These small purchases can be lifelines for unhoused people; they may reduce the amount of isolation and physical harm a person experiences from being unsheltered, and therefore the amount of time they'll be spending on the street or in shelters. If you’re worried about where the cash will go, offer to pay the money directly to the intended cost: go directly to the hotel and pay for a night, go with the person to the phone store and pay their bill, or go to the local restaurant they frequent and pre-pay for a couple of meals. Housing First is an approach to homelessness that provides permanent subsidized housing to chronically unhoused people as the first step in addressing complex problems. Research shows that problems that contribute to long-term street sleeping such as mental health problems, addiction, and physical disabilities can’t be resolved until a person has a place to call home. Arresting people for crimes associated with street sleeping such as public urination and loitering make the problem even worse—it extends the time a person will live on the street, prevents them from stable employment, traumatizes them, and costs taxpayers millions of dollars more than a subsidized apartment would. Research overwhelmingly shows that helping someone keep housing is much more cost effective than trying to get someone re-housed after they’ve lost housing. You can help by pooling your own friends and family’s resources to help a vet that is at risk of losing housing keep that housing by paying their rent or other costs for a month. If you can't do that personally, advocate for local community funding called Emergency Housing funds. This might be distributed through a local nonprofit, the Veterans Service Office, or a place of worship. There are a number of organizations that work not just to manage homelessness, but to end it. 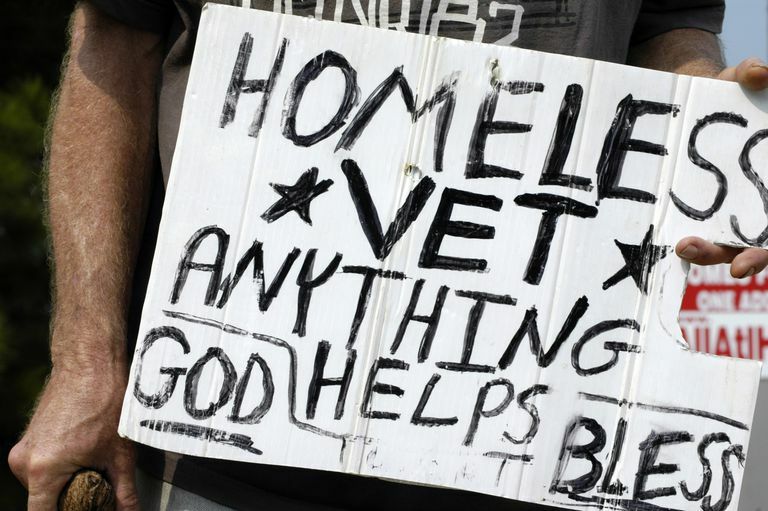 The Department of Veterans Affairs launched an initiative in 2009 to end Veterans Homelessness. However, as long as homelessness is a ubiquitous part of life in the U.S., vets will continue to find themselves among those without housing. Organizations such as the National Alliance to End Homelessness and the National Coalition for the Homeless lobby officials to implement concrete measures to reduce and end homelessness, produce research about the high cost of homelessness to taxpayers, and train regular people like you to become advocates for housing all people within your community. Grover Wehman-Brown is a writer living in Western Massachusetts. She received a PhD in Communication from the University of North Carolina.